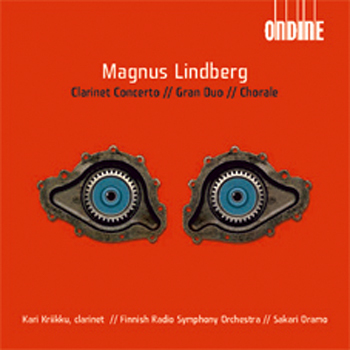 Brilliantly extrovert and entertaining piece from the Finnish composer, requiring the clarinettist (the astonishing Kari Kriikku, for whom it was written) to take on a fluttering solo line full of multiphonics and other special effects. A giddy 25-minute flight through an enchanted forest of bewitching sounds. The concerto is alive and well and flourishing in Northern Europe, especially given Kari Kriikku's breathtaking virtuosity. Apart from Kari Kriikku's stunning playing in the Concerto, there's a dazzling kaleidoscope of colour from Oramo and the orchestra, in music that's completely up to date without losing touch with traditional forms. The excellent clarinetist Kari Kriikku, remarkably accompanied by Sakari Oramo and the Finnish Radio Symphony Orchestra, shows a breathtaking facility when playing with the challenges of this magnificent music. Here's a wonderful trio of pieces by one of Finland's finest contemporary composers. (...) the performance couldn't be bettered. There are also gems like this one, waiting to be discovered, proving conclusively that Classical Music is not dead, and may even (...) be thriving. (...) All of the performances under Sakari Oramo are just plain stunning, and so is the sound. What a terrific disc!